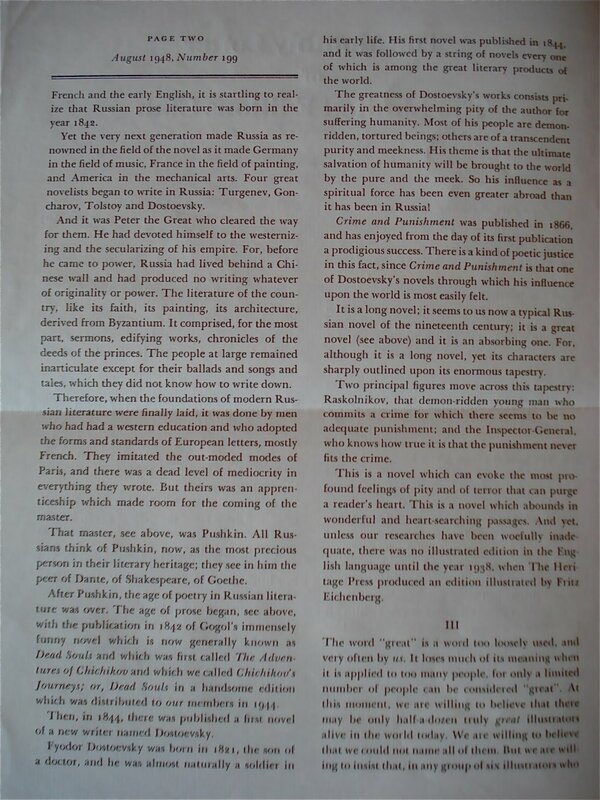 Reprint of LEC #108, 10th Series, V. 2 in 1938 in five volumes. 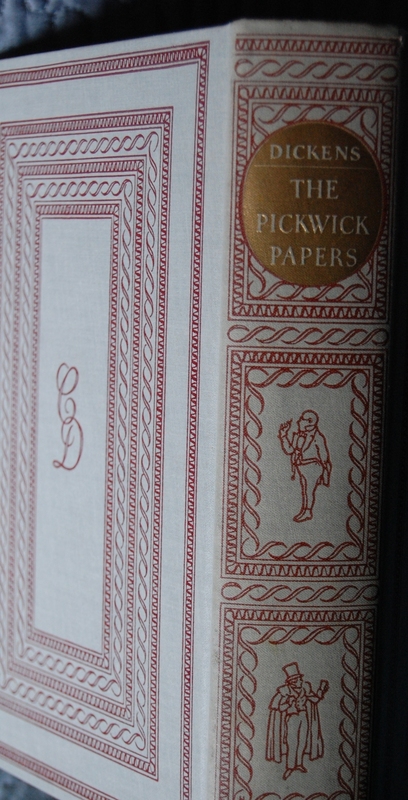 Originally issued European style, bound in paper wraps. 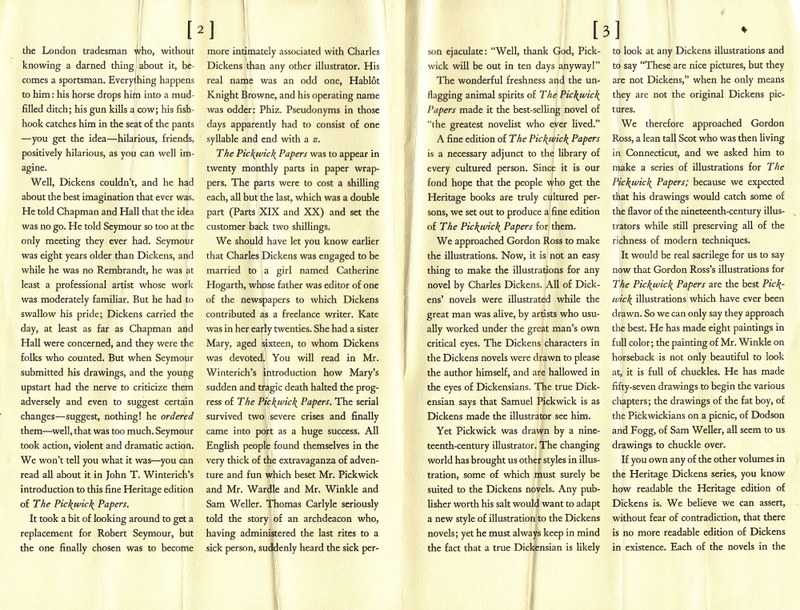 But when many subscribers complained about the paper bindings, the publisher rebound most copies in hardcover. 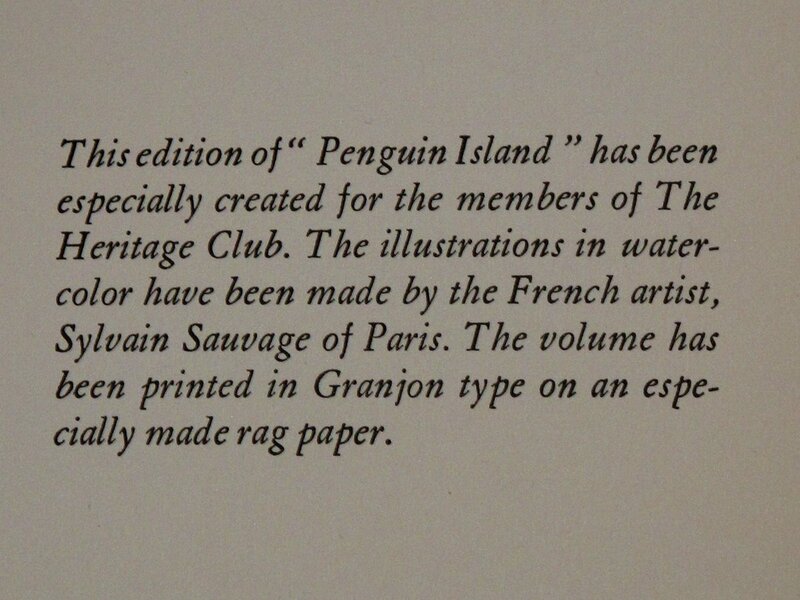 The second was less notorious when it was released in 1955, and Bernard Lamotte did the artistic honors. 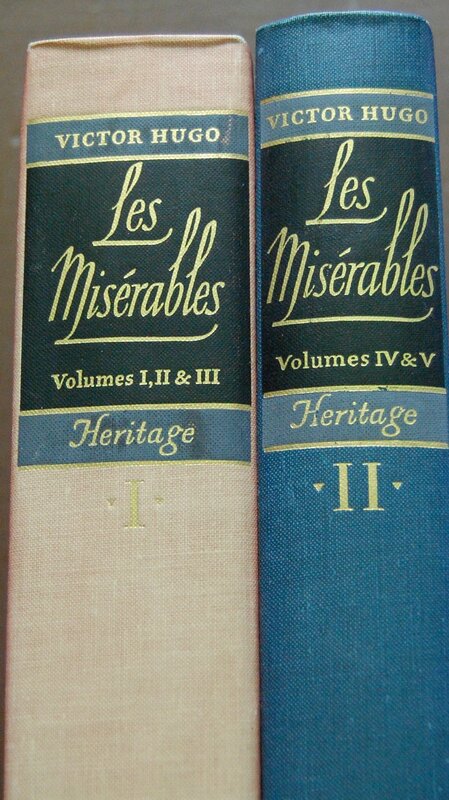 Les Miserables was a five volume LEC in 1938, and I’ll be sharing the two volume Heritage reprint with you shortly. After Macy’s death, Helen Macy commissioned The Toilers of the Sea in 1960, with Tranquillo Marangoni doing the artwork. 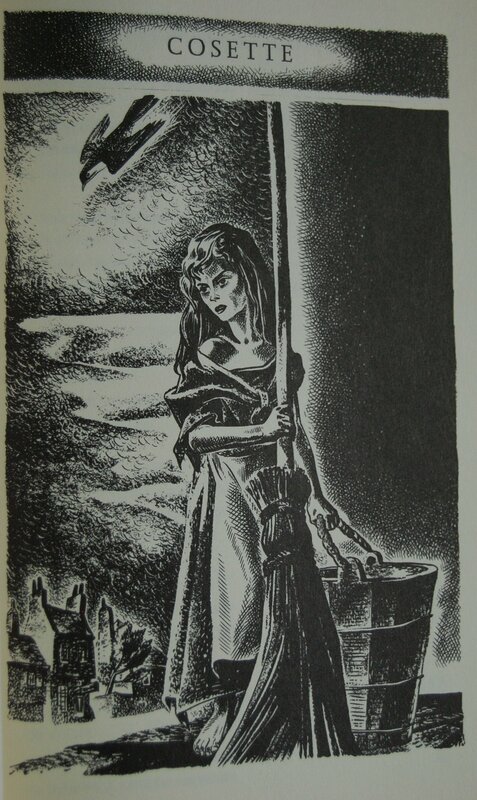 Cardevon would revisit Les Miserables in 1977, plucking The Battle of Waterloo from its pages for a standalone title with Edouard Detaille’s art. Not many people had two major works done twice in the LEC, so Hugo is a bit special in that regard. 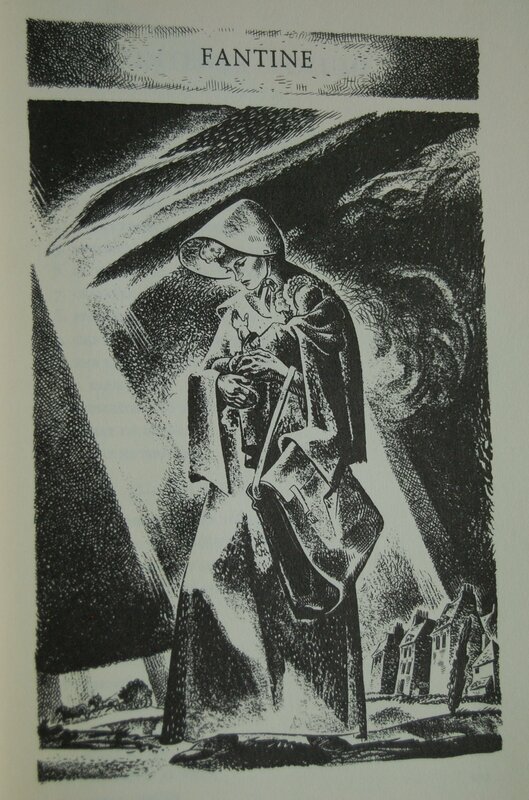 Reade, Charles, The Cloister and the Hearth, 1932. 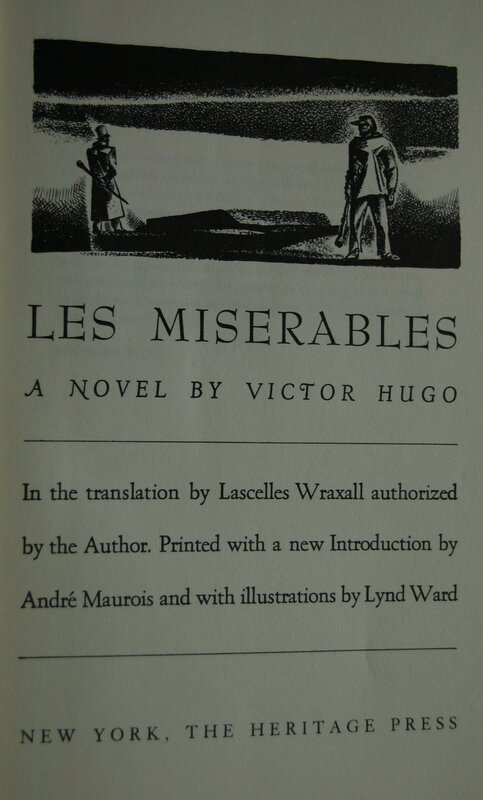 Hugo, Victor, Les Miserables, 1938. 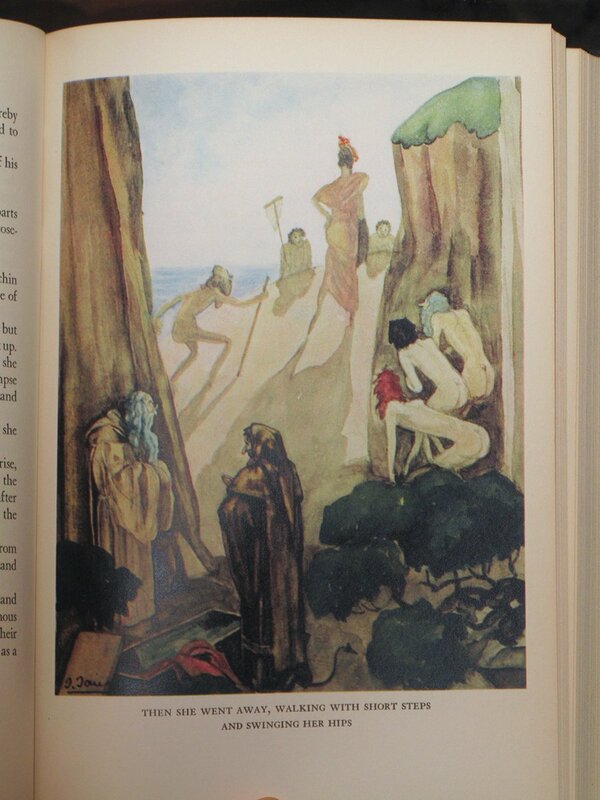 Dumas, Alexandre, The Count of Monte Cristo, 1941. Hemingway, Ernest, For Whom the Bell Tolls, 1942. 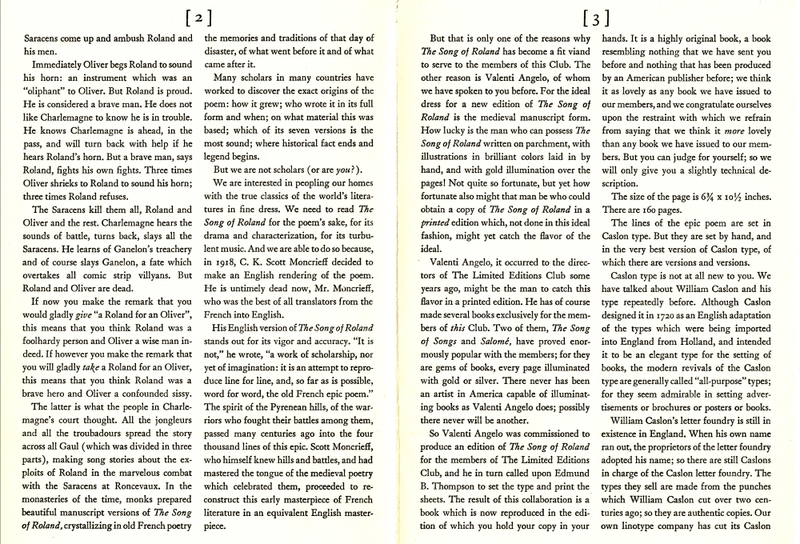 Erasmus, Desiderius, In Praise of Folly, 1943. Hughes, Richard, The Innocent Voyage, 1944. 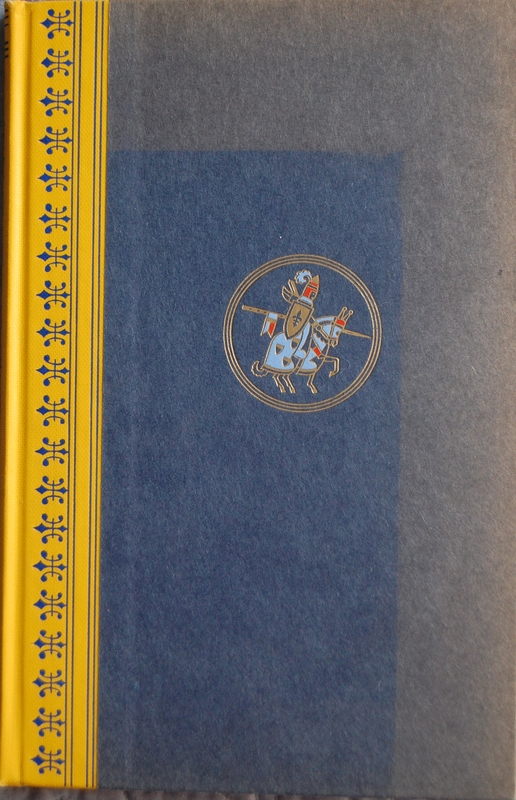 Tennyson, Alfred Lord, Idylls of the King, 1952. 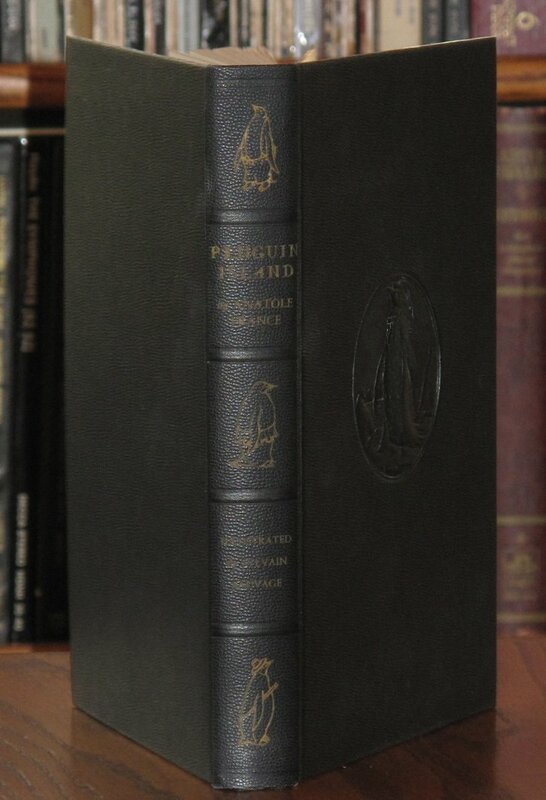 Conrad, Joseph, Lord Jim, 1959. Paine, Thomas, Rights of Man, 1961. 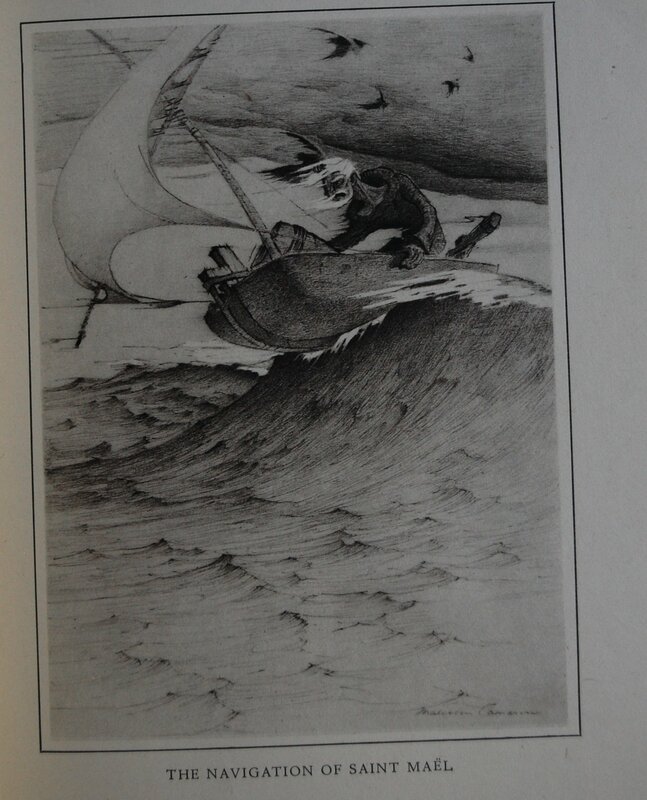 Stevenson, Robert Louis, The Master of Ballantrae, 1965. 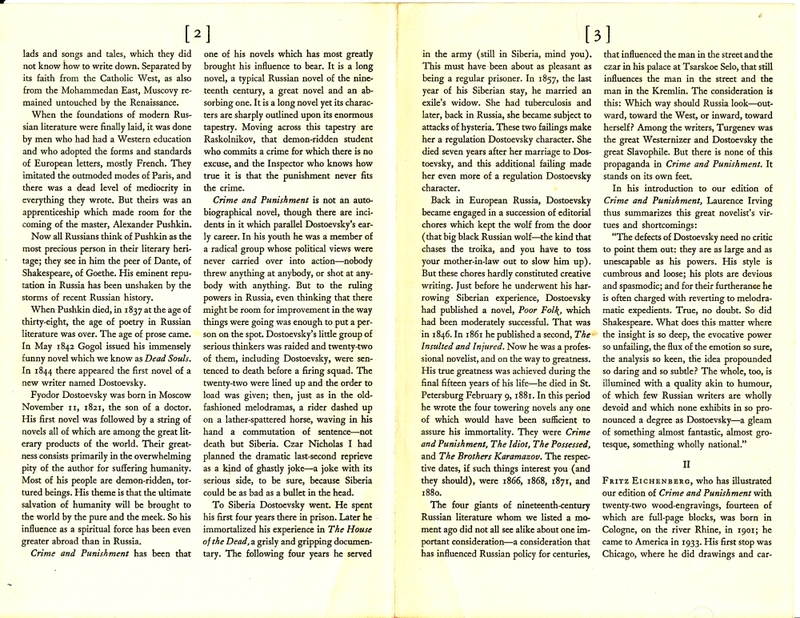 Jefferson, Thomas, Writings of, 1967. 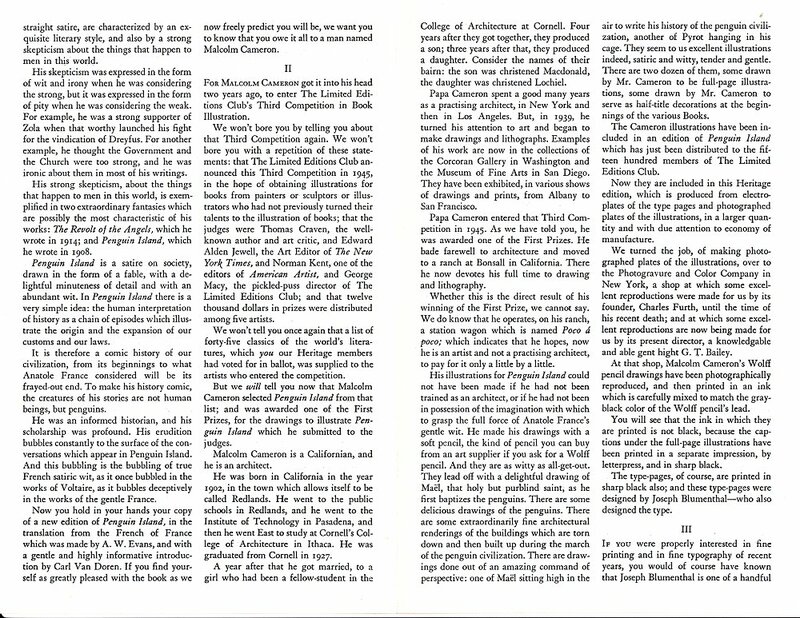 Burke, Edmund, On Conciliation with America and Other Papers on the American Revolution, 1975. 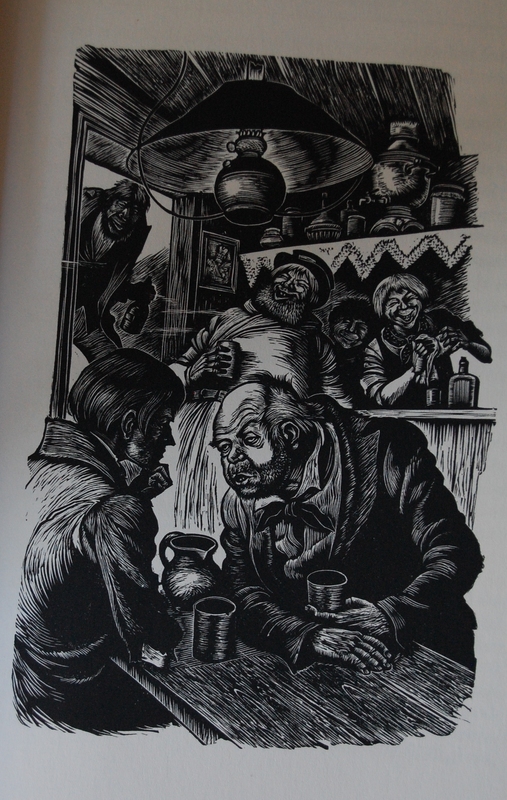 He also did Gargantua and Pantagruel (1942) and Dickens’ Our Mutual Friend (1957) for the Heritage Press. 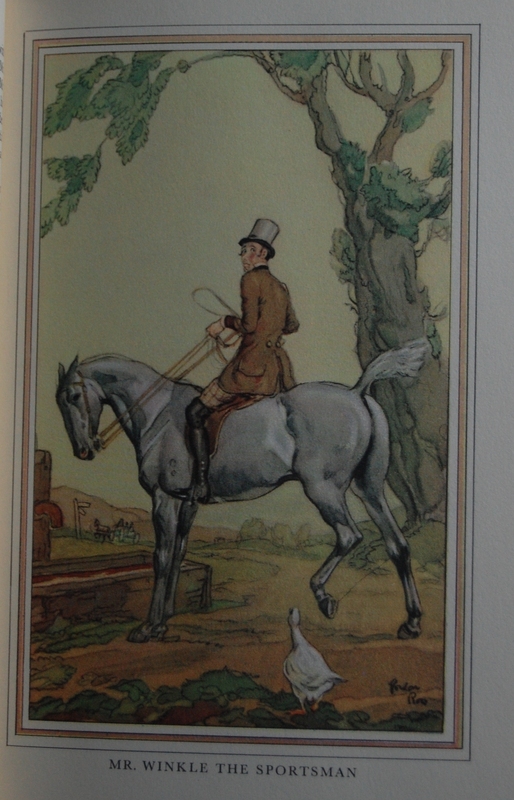 For this particular book, he did over 500 individual illustrations! Most of them are rather small, but I’ve included some of the larger ones to marvel over. The book was designed by Peter Beilenson (Django6924 confirms Beilenson also handled the LEC. 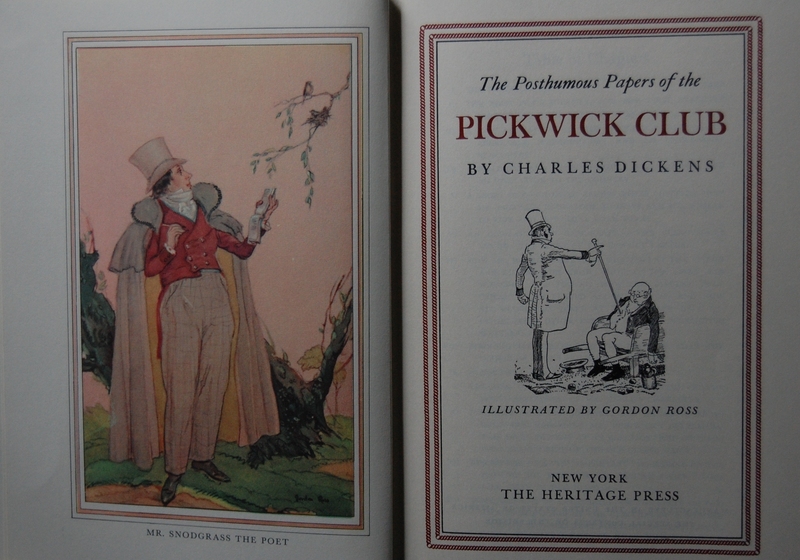 He was the designer/owner of the Peter Pauper Press, for those curious about such things. Thanks Robert!). Granjon is the font of choice here. 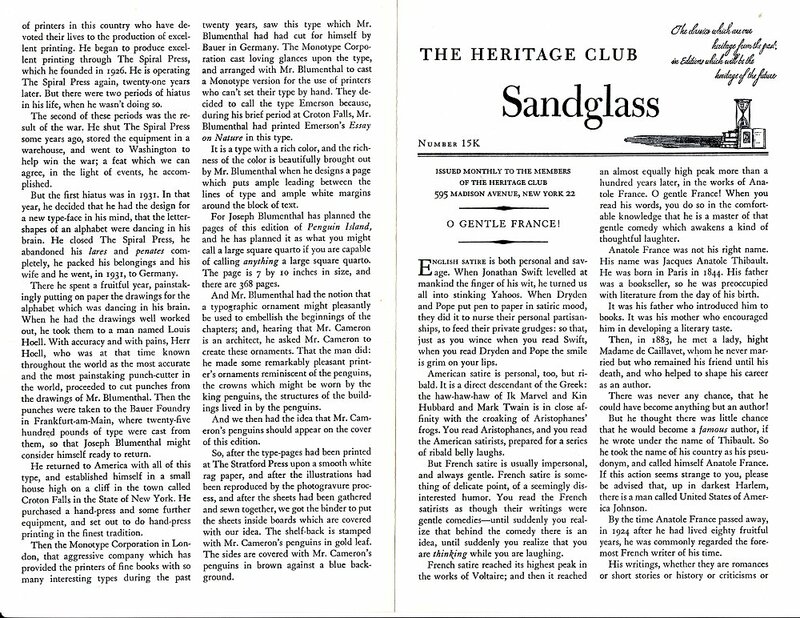 There’s a good chunk of the third page in the Sandglass devoted to the history of Garamond, a related font to the one chosen. 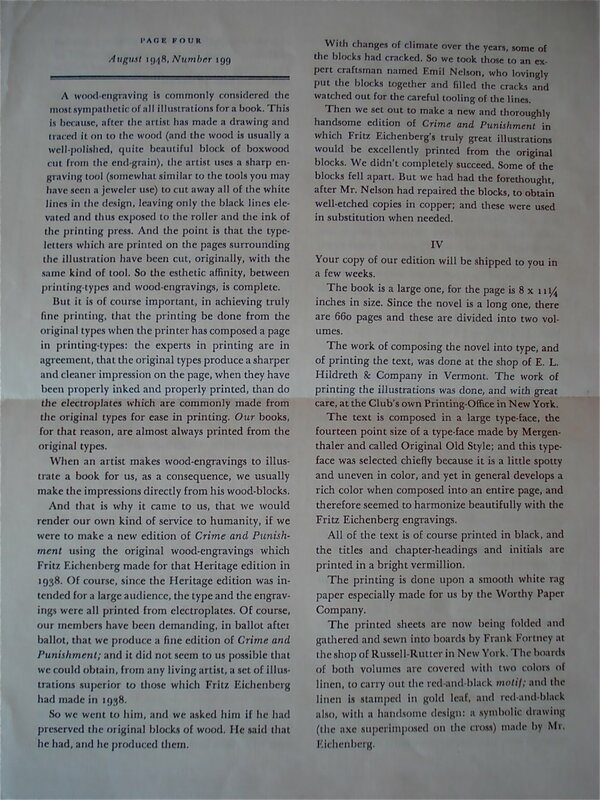 Duenewald Printing Corporation handled the printing duties, putting their ink upon specially made paper supplied by Crocker-Burbank. 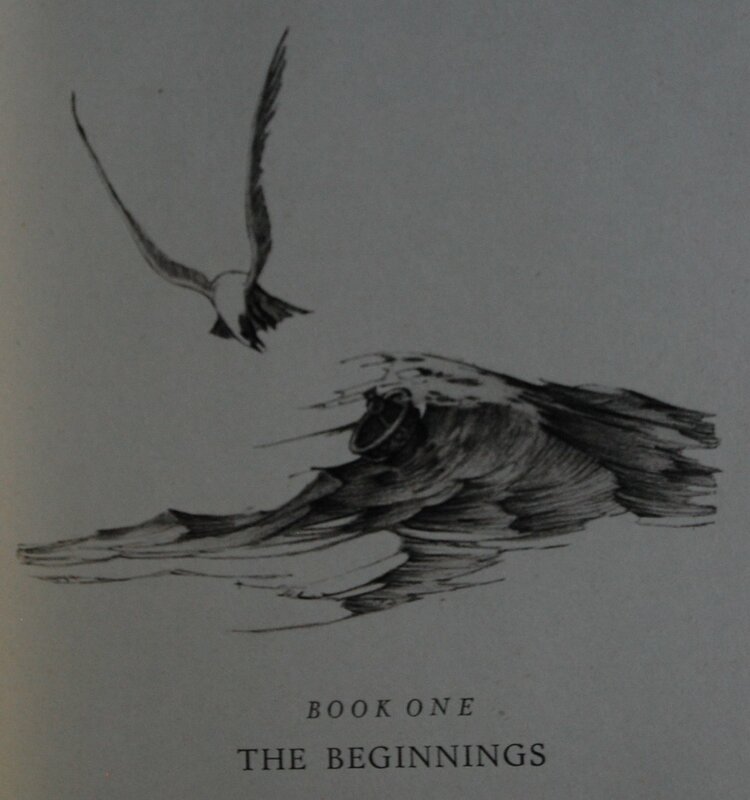 Arnold Bank was responsible for the binding design of the spines (or backstrip, as the Sandglass refers to them). 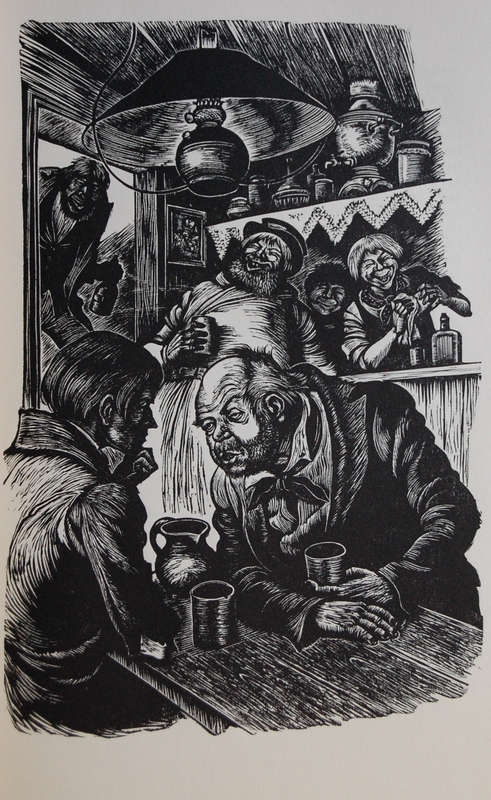 Russell-Rutter was the bindery. 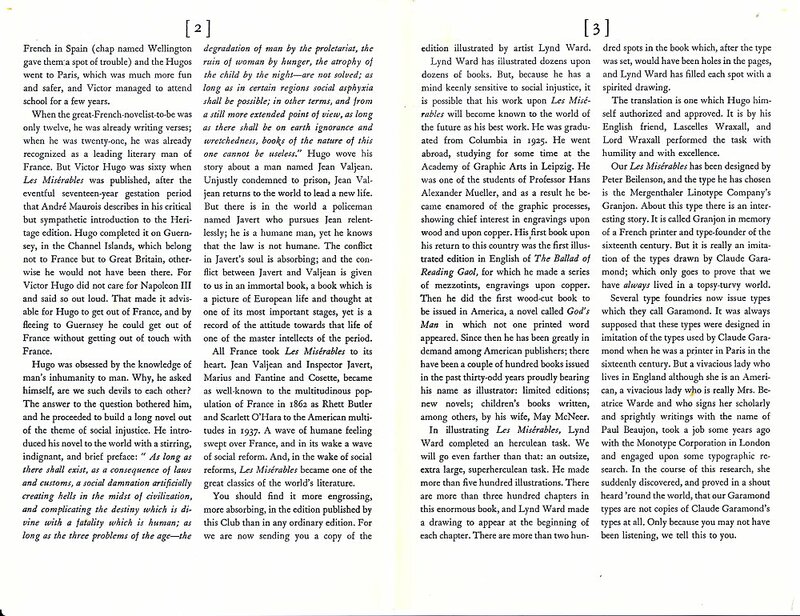 My edition of the work has seen some sun strip away the first volume’s red blaze, rendering it into more of a dull pink. The blue on Volume 2 is still strong, though. You’ll see the sad state of my Volume 1 below. 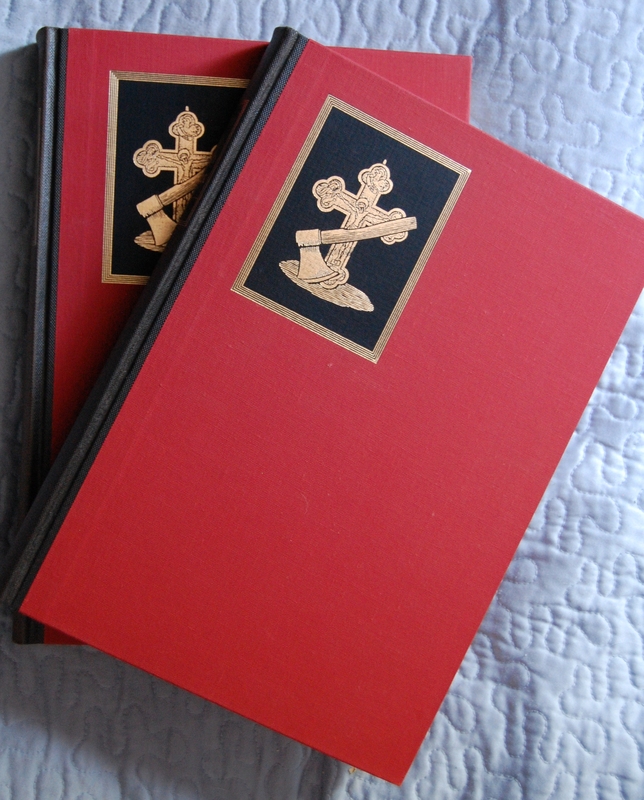 Slipcase – Both books are in black slipcases. 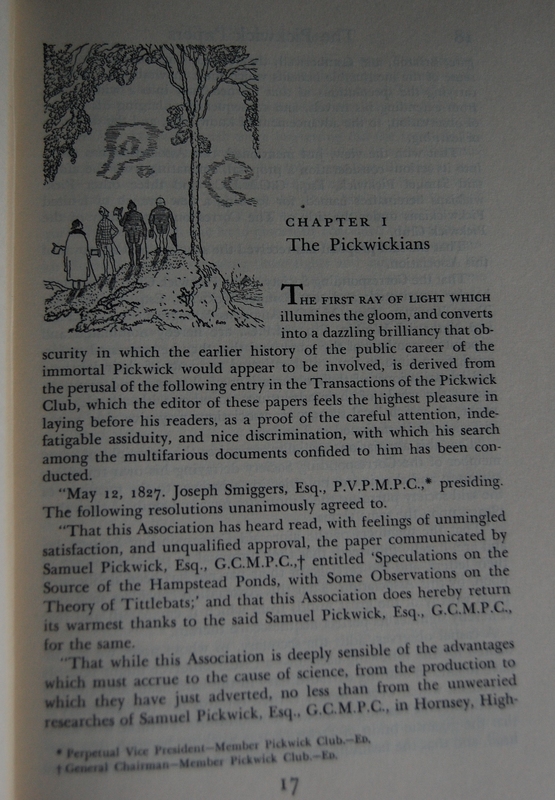 Title Page – Lascelles Wraxall (not the most common name) did the honors of translation, which his friend Hugo readily ratified. 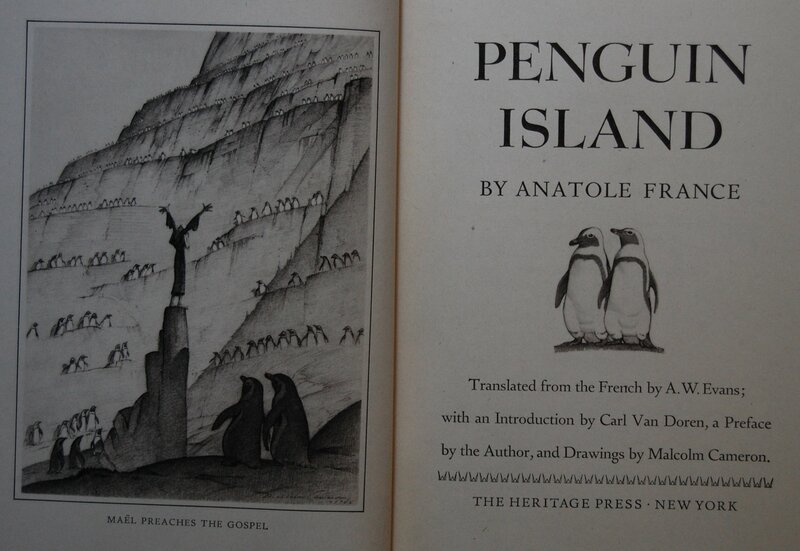 Andre Maurois, well-known biographer of the time (probably best known for Disraeli), supplies a new introduction. 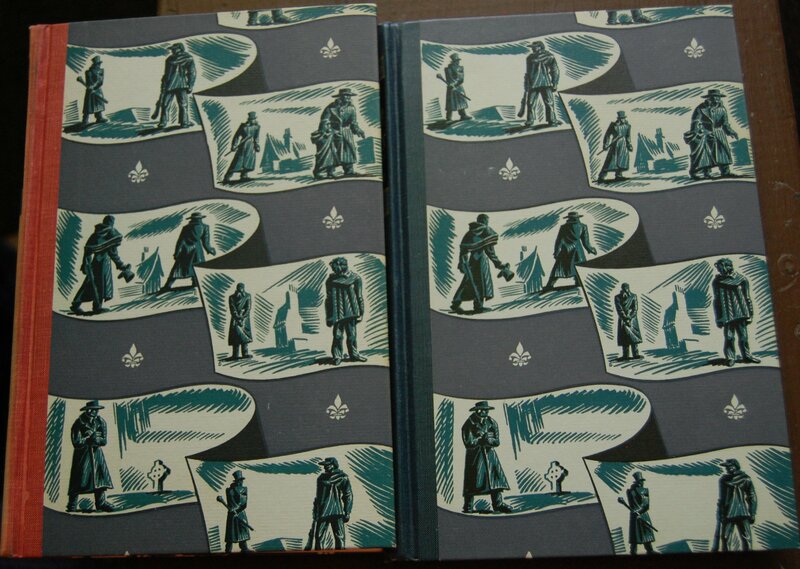 Fantine – Ward’s smaller sketches are nice and all, but these book dividers are among his finest work. It’s easy to see why he was commissioned so often. Note – I have added the Monthly Letter from the LEC edition to the post, but have not put in those details into the post yet. It will happen in time. Click the images for larger views. Heritage will be on top, LEC on bottom. 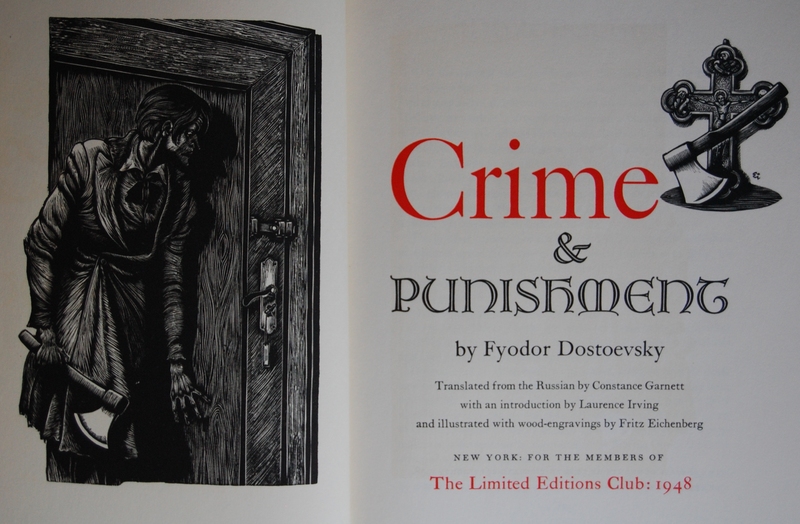 Front Bindings – Crime and Punishment is Fyodor Dostoevsky’s most legendary work, and it has been ravishingly designed for both its Heritage and LEC editions. 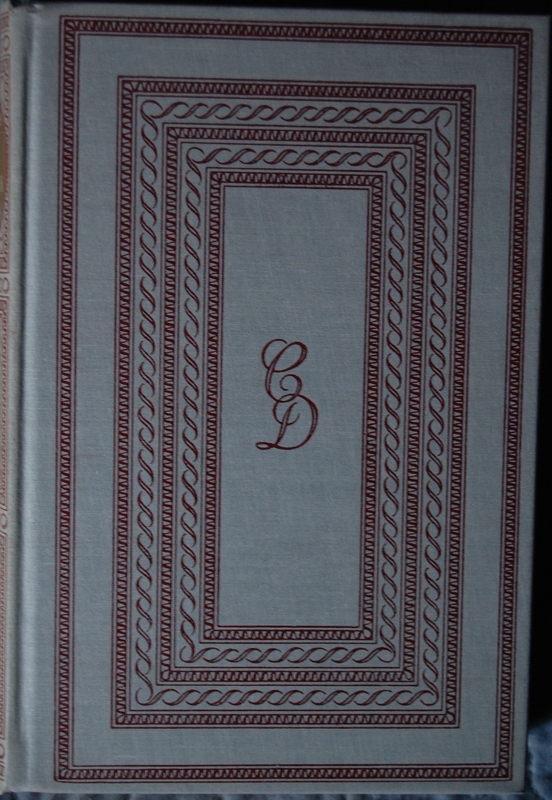 Occasionally the Heritage Press would have their edition come out first, with a LEC two-volume reprint following that – this is another example of this (Moll Flanders and Beowulf are two others I know of). 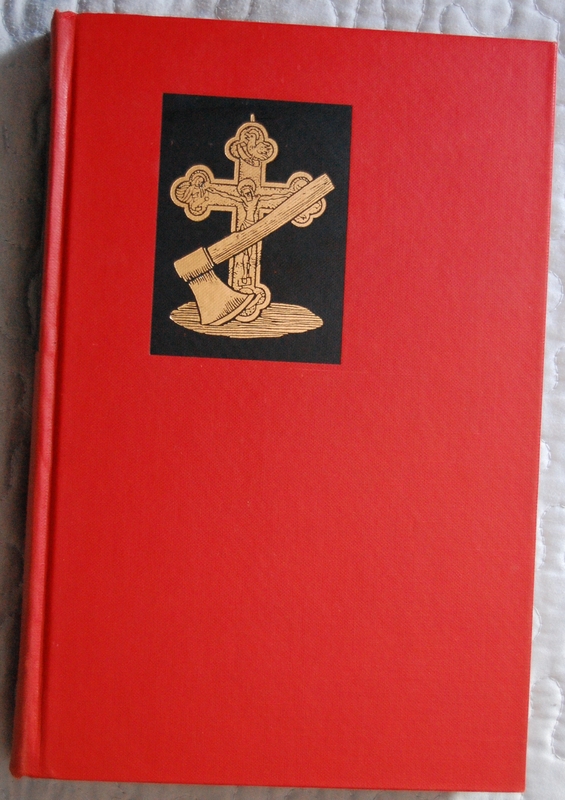 Both went with a striking red for its boards, with a black block inlay of a cross and axe done by the book’s illustrator Fritz Eichenberg. This was, to my knowledge, Eichenberg’s very first commission for the George Macy Company, and it wouldn’t be his last. 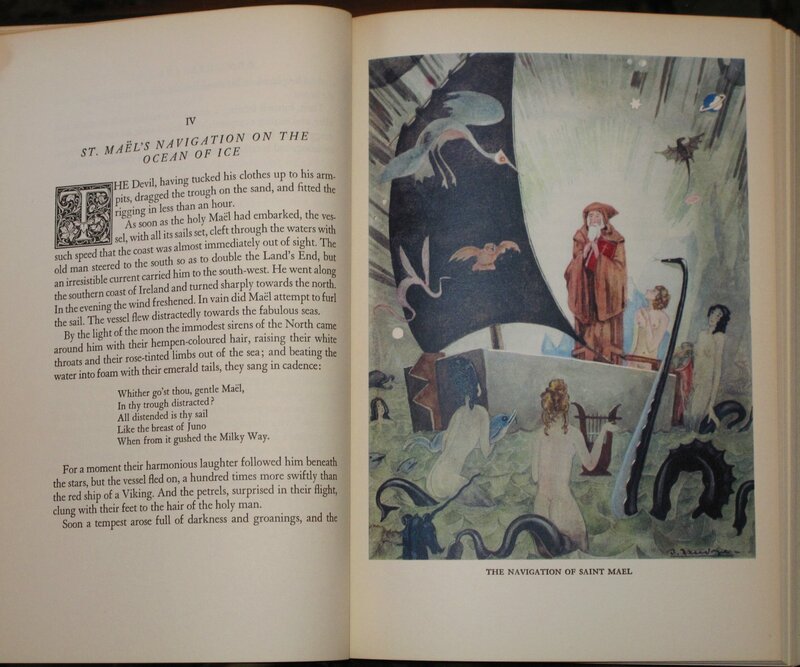 In fact, he would illustrate books for the LEC until 1986, when his last work, The Diary of a Country Priest, would be released by Sidney Shiff’s Limited Editions Club. Almost 50 years of illustrating magic! 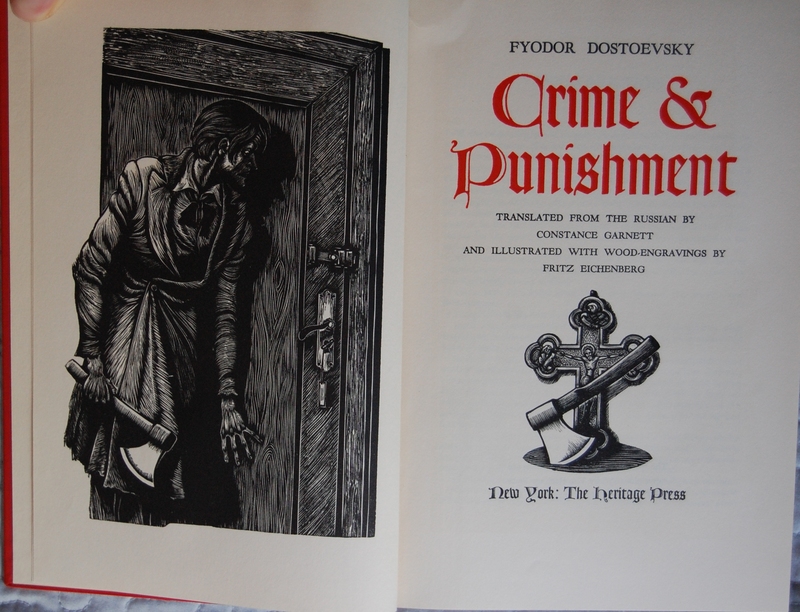 As of right now, I’ve got two other books up with Eichenberg’s work for those curious to see more – the LEC House of the Dead, also by Dostoevsky, and the Heritage Eugene Onegin by Pushkin. 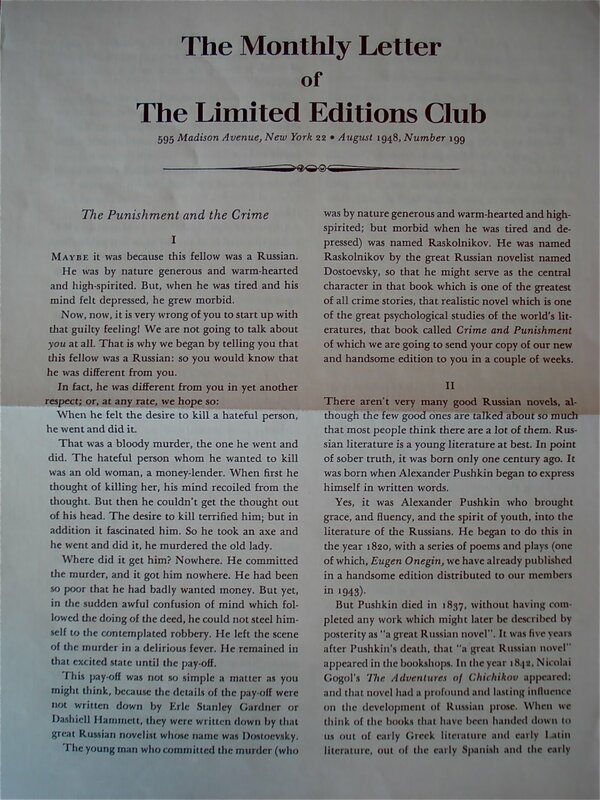 The LEC Crime and Punishment was designed by George Macy himself. 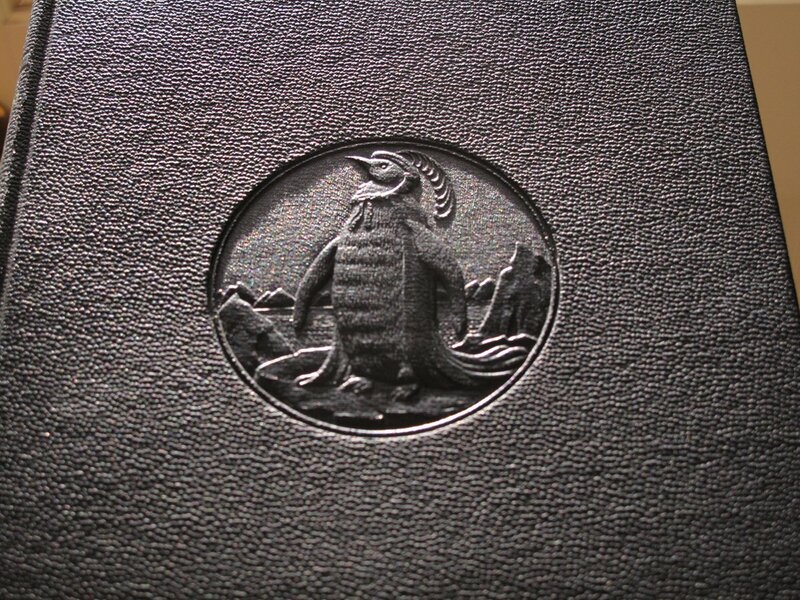 Printed by E. L. Hildreth and Company; set in linotype Original Old Style, Worthy special paper; bound by Russell-Rutter Company. 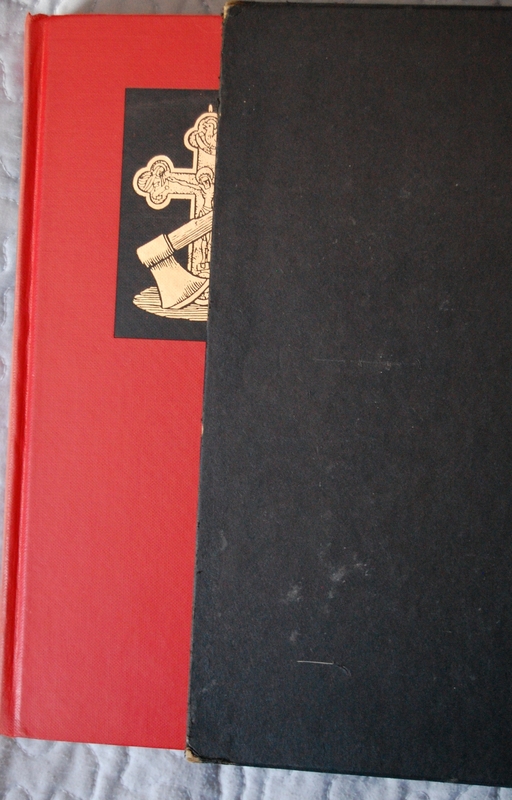 Russell-Rutter did the binding for the Heritage as well. 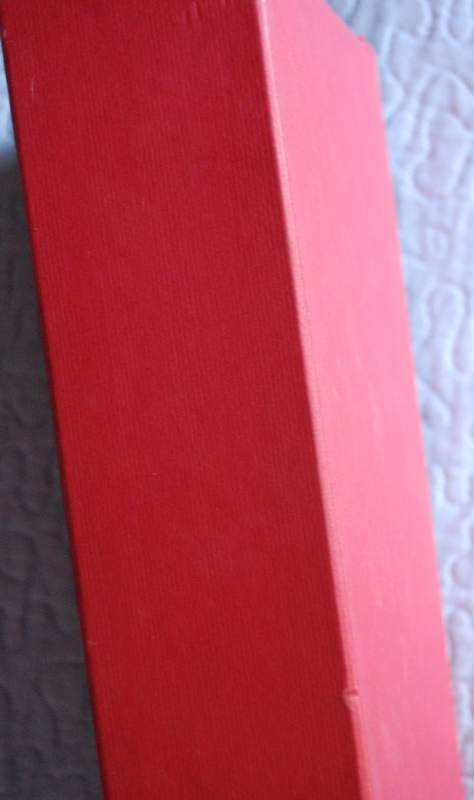 Slipcase – The Heritage went black, the LEC went red. 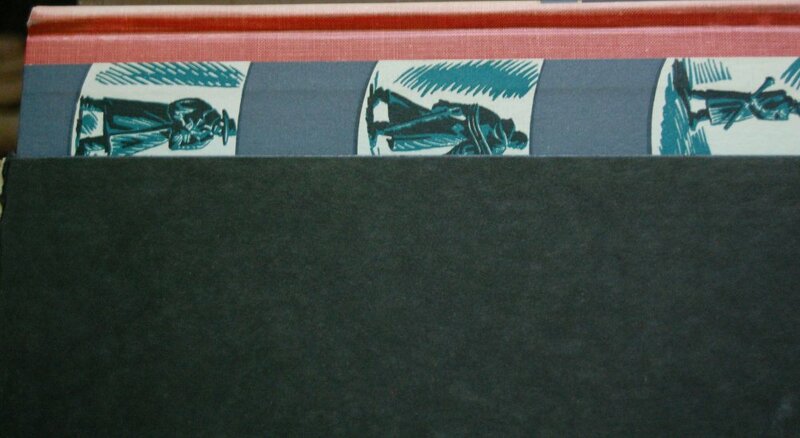 Oddly, there’s no label or printing on the LEC slipcase indicating what it is, which is a little weird. Maybe I’m missing a interior case. Title Page – The Heritage and LEC title pages are radically different in structure, and I musy admit a preference to the LEC in this case – the use of color makes it pop more, and I like Eichenberg’s cross by the title. 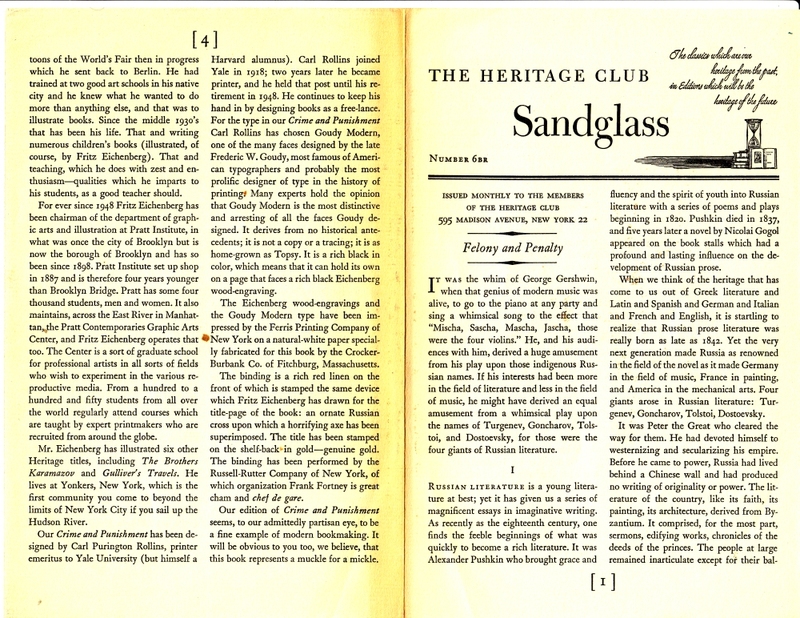 Goudy Modern is the font chosen by Rollins for the Heritage, while the LEC was “set in linotype Original Old Style”, to quote kdweber. 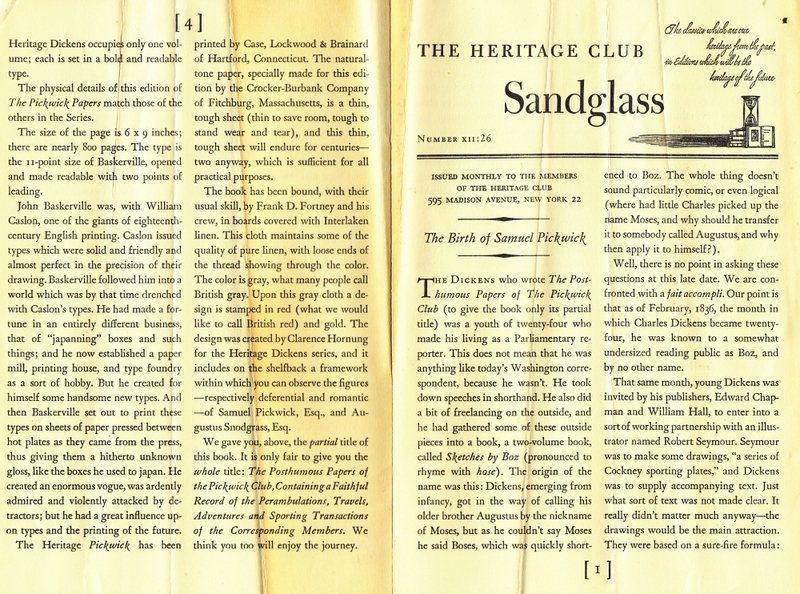 To wrap up the Heritage printing information, Ferris Printing did the etching/text printing honors on Crocker-Burbank Co. paper made especially for the Heritage original. 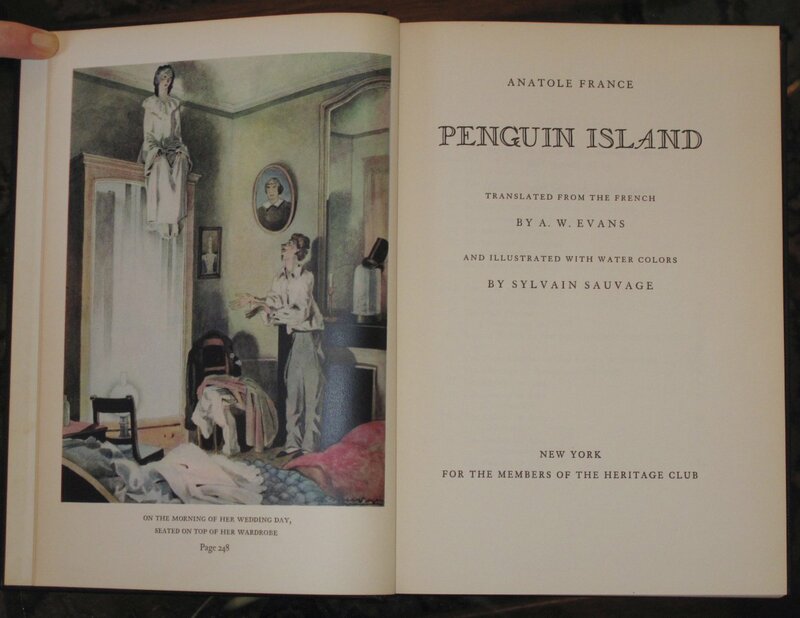 George Macy went with the popular Constance Garrett translation, and Laurence Irving provides an introduction to both volumes (the Heritage omits mentioning him for some reason). 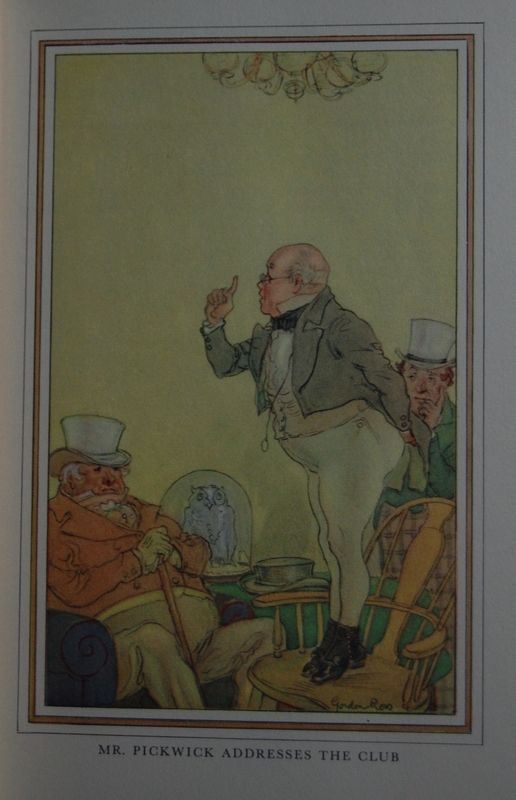 Signature Page – I must admit to being a little tickled at having #1500 for this book. 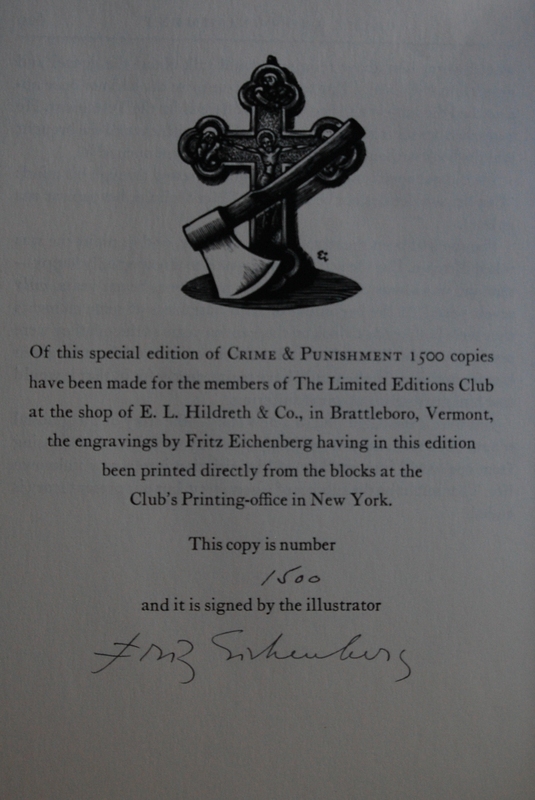 Eichenberg’s signature is nice, too, as I adore his work. 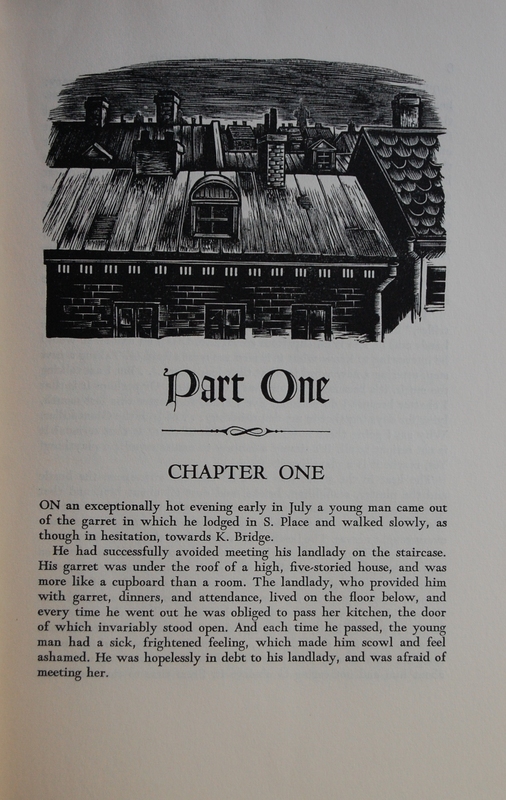 Eichenberg’s wood blocks were reused for the LEC edition by George Macy’s own printers, which is pretty neat. 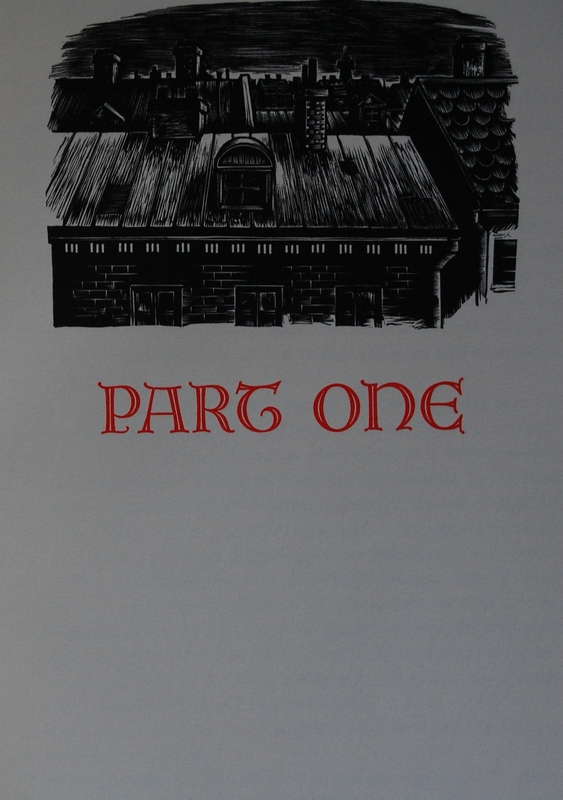 Page 1/Part One Introduction – More stylistic diversions here, as the Heritage begins Part 1 with the first Chapter on the same page, but the LEC makes a special introductory page for Part 1, and then starts Chapter 1 on the next page. 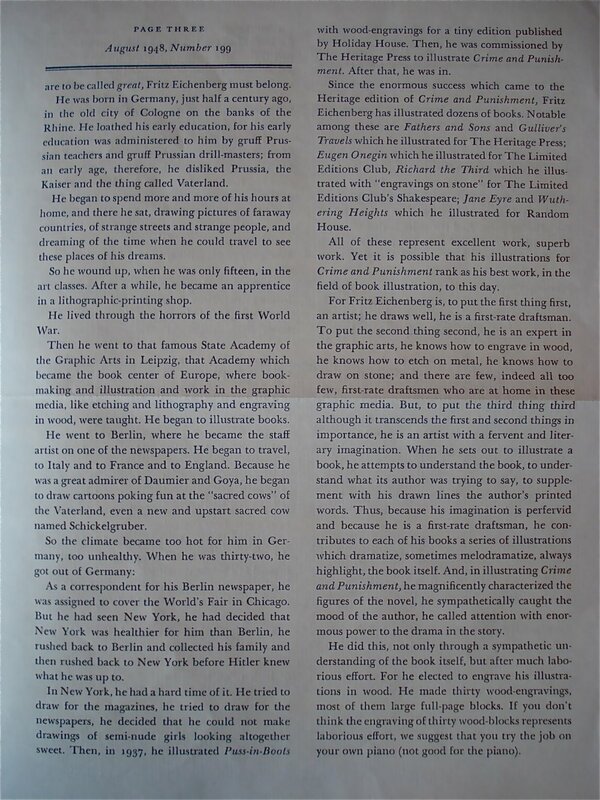 Page 18/Page 17 – Eichenberg, you don’t fail to astound me. 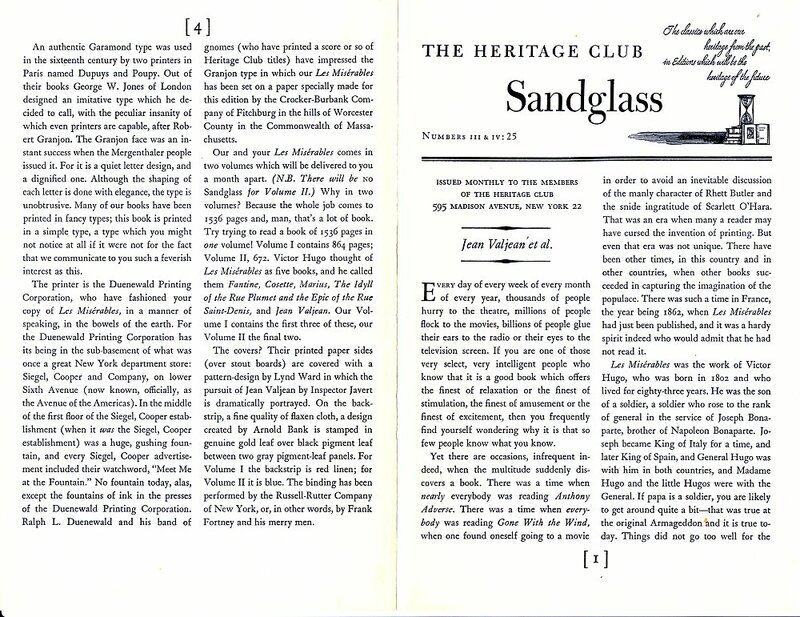 Personal Notes – I bought the Heritage first at a library book sale in Oakhurst in 2009 or so, with a bevy of other books in what was my best haul at the time (I just topped it a couple weeks back). I paid $3 – 4 for it, I think…may have been $2. Not bad for a complete Heritage book. I got the LEC this past May from my former anthropology instructor, who won it at a local auction and asked me if I wanted it. That was a silly question. I owe him $50 for it whenever I can get it to him. I prefer the LEC, but both are excellent books! Then Mr. Angelo proceeded to illuminate and color the binding. The sheets are bound into heavy boards. The boards are then covered with a back of bright yellow buckram imported from England, and stamped with a design in monk’s-blue leaf; and with sides of a brilliant blue kraft paper upon with a design by Mr. Angelo appears, in blue and red and green and gold. 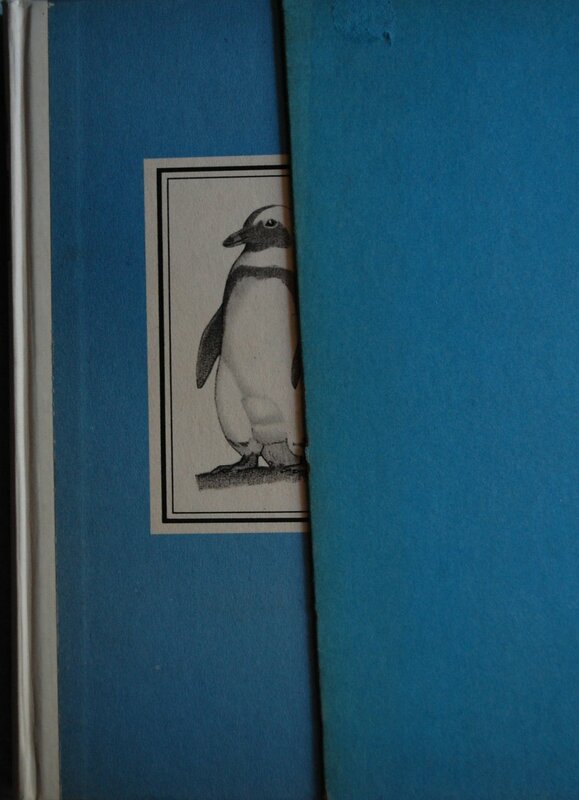 My copy has seen its fair share of sunlight, which is the unfortunate gray stripe you can see on this shot. The back lacks the decoration, but is the same otherwise. 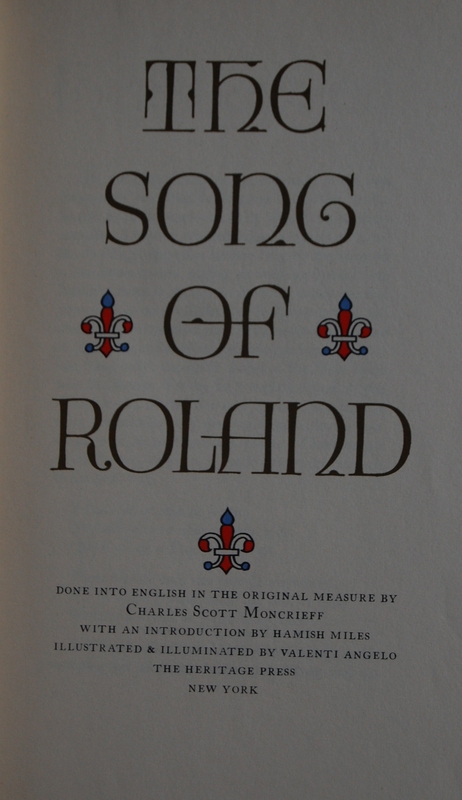 Title Page – Before you get too excited, Angelo did not illuminate this edition by hand, per say – he did do such a feat with the LEC original, but here the gold was done through silk screen application. The title font is gold, but it’s hard to tell here. 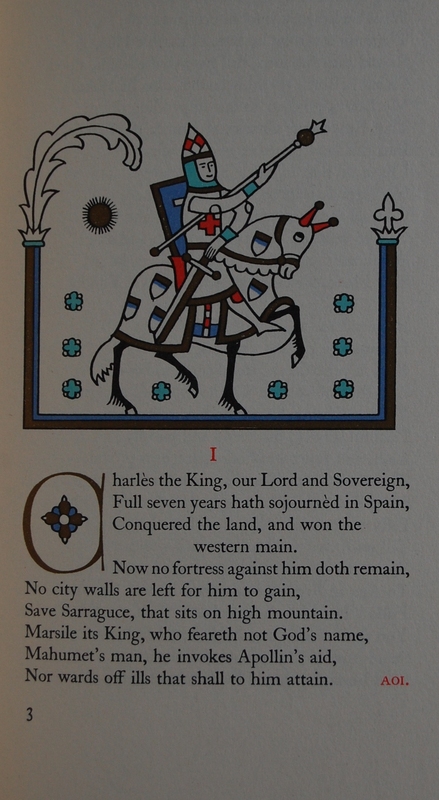 Three examples of Angelo’s decorations with the text follow. Let’s focus on Thompson for a moment. 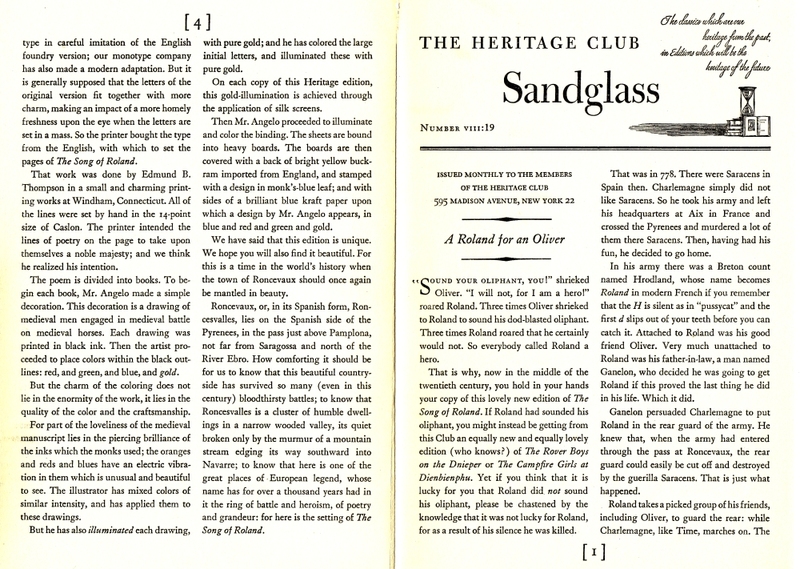 The poem’s lines are done in Caslon by hand, which is covered thoroughly by the Sandglass for those intrigued by the development of text over the years. The binder is not specifically stated – I would assume Thompson did the work with Angelo’s artistic assistance, but I really have no clue. Page 3 – Here’s a quick summary of Angelo’s decoration creation process. Angelo began with the basic black outline of his art, which he then embellished with inks of alternative colors – blue, green, red. 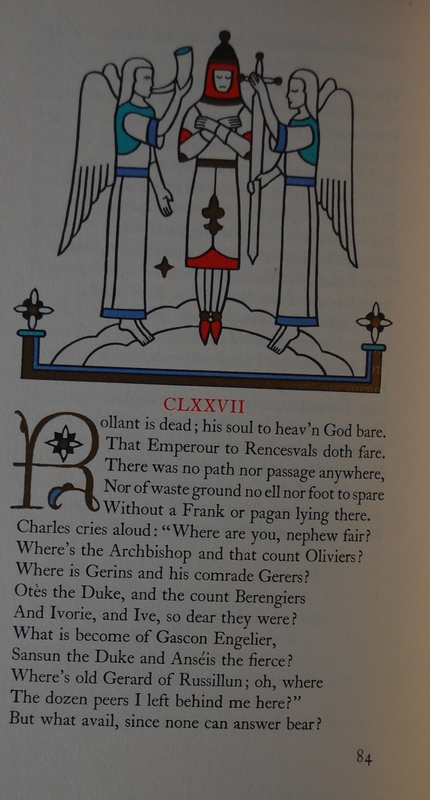 He then hand-illuminated each illustration with gold. Angelo deliberately wanted to use dynamic and striking colors to recreate the feeling of medieval manuscripts, so he chose vivid inks that would be intense on the page. Very classy work. 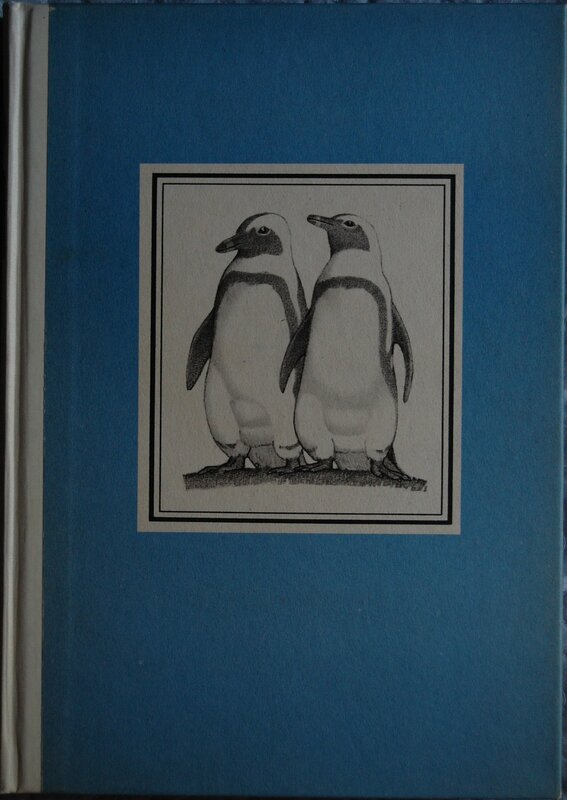 Personal Notes – I got this for $1.00 from the anthropology club book sale at my old college, and it’s quite a looker, despite its faded boards. I’d like to see the LEC one day. You are currently browsing entries tagged with 1938 at The George Macy Imagery.